Have you ever lost something–out of the blue, you know you had it one moment and then several minutes, or hours, later you realize it’s not where it was supposed to be? The feeling of panic of having to tell the person who gave you the beautiful gift, that you now fear it has gone the way of socks in the dryer; it can be enough to make you just sick to your stomach. During the last Christmas season our boss took us to lunch as a holiday gift. Every year we go to a posh Italian restaurant downtown, the kind that has valet parking and the waiters wear tuxedos, it’s quite lovely. On the particular day of the luncheon last year, as I was getting dressed and choosing some jewelry to wear, my husband suggested that I wear the beautiful charm bracelet he’d given me for my birthday the previous year. Pandora-like bracelets were all the rage at the time and he wanted me to have one with charms to remind me of our relationship, as well as our grandchildren. 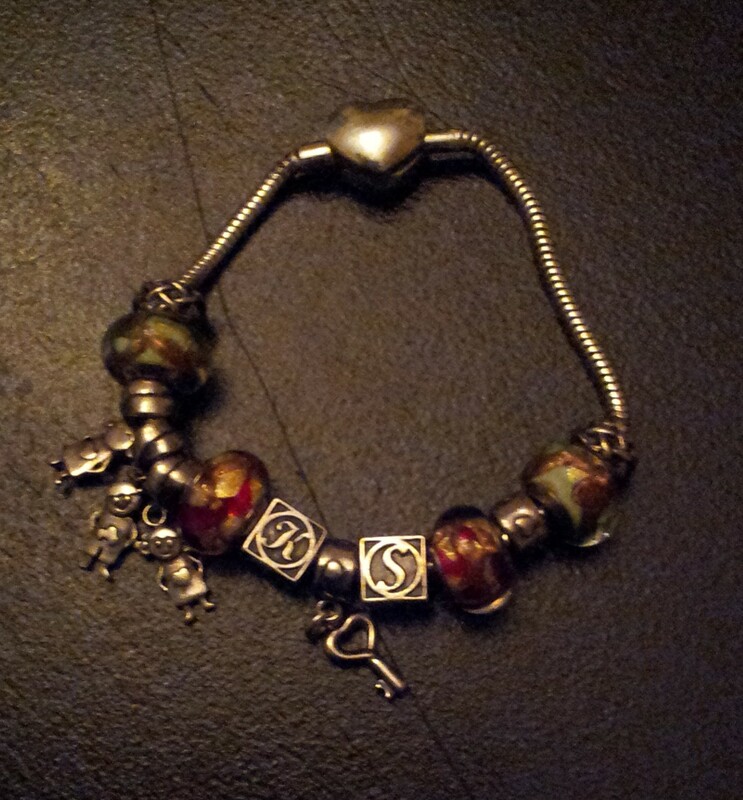 Little red beads, our initials “S” and “K”, two little girls and one little boy, a couple of more decorative beads, with a heart for the clasp completely fill the bracelet completely. It’s heavy enough to know you’re wearing but not so heavy it is distracting. He even fastened it securely to my wrist before I left the house. We were sitting at the table waiting for the last of our party to join us when I folded my hands on the table and realized the bracelet was not on my wrist. I was horrified, sad, worried all at the same time; and this continued throughout the meal. Over and over again I found myself saying a prayer to St. Anthony to help me find it by the time the day was over. I texted a coworker to look around my desk and up and down the stairs and hallways, in case it had fallen off in the building. I asked the maître d’ if it was found to call me as soon as possible as I handed him my business card on the way out of the restaurant. One of my coworkers who’d been a passenger in my car for the quick trip downtown asked on the way back if I’d ever lost the bracelet before? I recalled it had fallen off once before when it caught the edge of my jacket as I slid my arm down through the long sleeve. She suggested that when we got back to the parking lot at work that I look on the ground were my car was parked…good idea. Back at the lot behind the building I was able to pull into the exact spot I’d occupied before we left for lunch. I stepped out, along with the my passenger who’d made the excellent suggestion to look on the ground near the car. SUCCESS. The bracelet was right there, just under the car but easily within reach. I admit I shed a tear or two, breathed an amazingly long sigh of relief and gratitude, and gave a huge hug to my coworker to thank her!